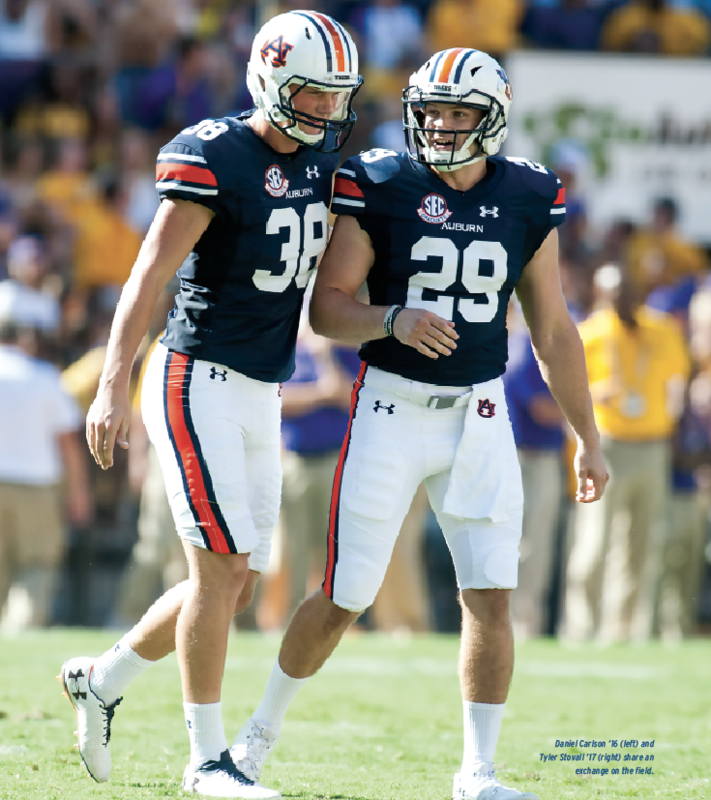 Down on the tarp-covered grass of an empty Jordan-Hare Stadium, right in front of the southernmost field goal post, former Auburn kicker Daniel Carlson ’16 stood in front of a camera holding a bronze statue of a seated Auburn football player waiting to get into the game. 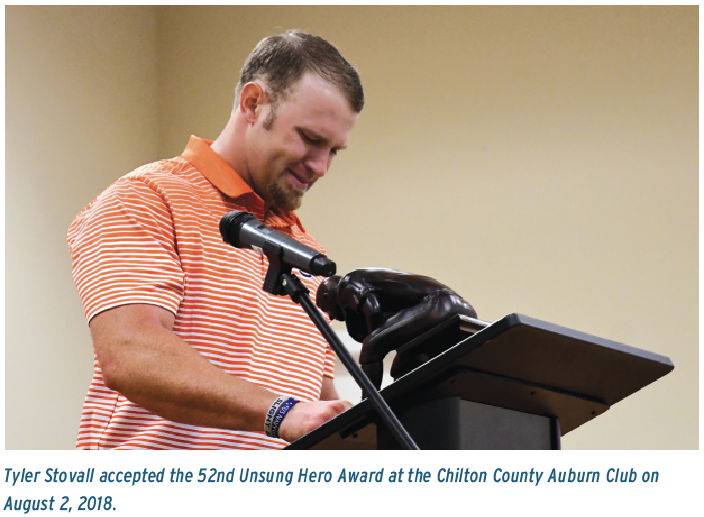 The video that was taken that overcast day, as well as the words of gratitude that Carlson expressed, were heard by Chilton County Auburn Club members and by former Auburn holder Tyler Stovall ’17 as he accepted the club’s 52nd Unsung Hero Award on Aug. 2, 2018. Nyra Luster, the club’s president for the last two years, said the Unsung Hero banquet began in 1966 and is held to honor a senior at Auburn University who didn’t receive enough credit for their accomplishments. Luster said that the recipient’s life story also goes into the club’s decision making, and that they were impressed by Stovall, who, after leaving his professional baseball career behind, used his signing bonus with the Atlanta Braves to fund his education at Auburn and became the football team’s walk-on holder before later earning an athletic scholarship. Stovall, called “Papa Stove” by other players on the team, was at 28 the oldest player in the SEC before he graduated from Auburn. Despite being older than other players, Stovall managed to hold for an SEC record 198 consecutive points gained after touchdown and all-time kick-scoring total of 474 points over the course of 53 games. On top of his many accomplishments on the field, Stovall excelled in the classroom. He was on the SEC academic honor roll and was an Academic Top Tiger for several years while on the football team. Stovall graduated with a bachelor’s in business marketing in 2017 and began graduate study in the Harbert College of Business. The trophy given to Stovall was made by Mike Cooper ’74, a member of the Chilton County Auburn Club, perhaps known better by the nickname “Helmet Guy” and for his enthusiasm at Auburn baseball games. It was also Cooper who approached Daniel Carlson at a baseball game to ask if he would present the award to Stovall. Luster said that they wanted Carlson to present the award because of the kicker’s friendship with Stovall; the results paid off. The night of the Unsung Hero’s banquet was the first night that Luster and Stovall met in person after weeks of contact over the phone. Luster was struck by how genuine and down-to-earth Stovall was.